I have written before on this blog about tracking very distant space debris: the CZ-3C upper stages of the Chinese Lunar missions Chang'e 2 and Chang'e 3, which move in chaotic trans-Lunar orbits. I have embarked on a long-term project to follow these objects. Apart from positions to keep their orbits up to date, these observations also provide information about the tumbling behaviour of these objects. Both objects have a periodic variation in brightness: a very rapid one for 2010-050B, the Chang'e 2 upper stage, and a slow one for 2013-070B, the Chang'e 3 upper stage. Earlier, in July 2015, I had established a tumbling periodicity of ~7 minutes for 2013-070B. I have now been able to refine that value much better, to only a few hundreds of a second. With the help of Peter Starr from Warrumbungle Observatory (MPC Q65) in Australia and Krisztián Sárneczky from Szeged University's Piszkéstető Observatory (MPC 461) in Hungary, I could obtain two nice series of data the past week. The data were gathered on September 11 (Warrumbungle 0.51-m telescope) and September 14 (Piszkéstető 0.60-m Schmidt telescope). The first set, taken by Peter from Warrumbungle, is a set of 15 exposures of 30 seconds each, taken in ~1 minute intervals. The image at the top of this post is a stack of these images. 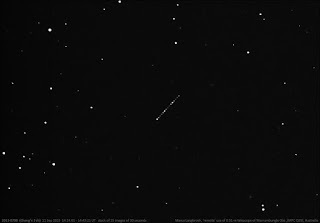 The brightness maxima can be clearly seen. 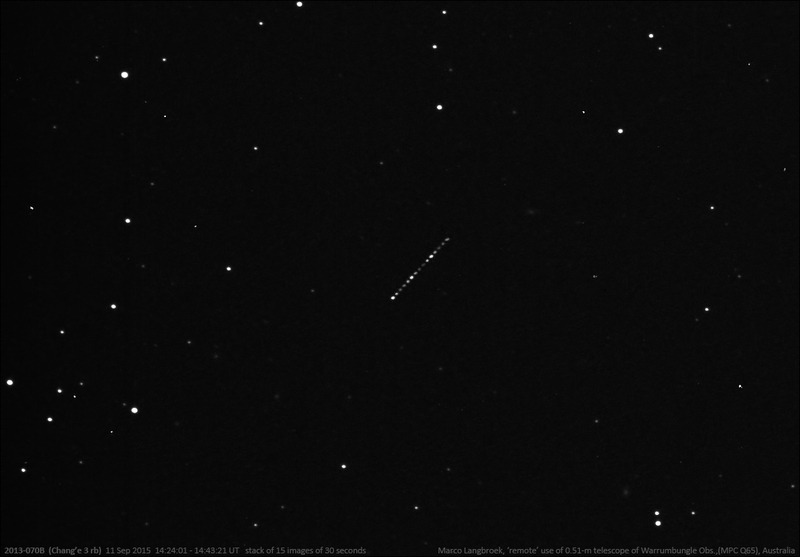 The second set, obtained in twilight by Krisztián from Piszkéstető at the end of a run of the Szeged Asteroid Survey, is a set of 18 exposures of 3 seconds (!) each, in ~20 second intervals, with a brief pause halfway the series. The data allow to fit a sinusoid to both sets simultaniously, and from that get a very accurate periodicity. The double diagram above shows this sinus-fit to the data. It allows to establish a peak-to-peak periodicity of 423.01 ± 0.03 seconds for the tumbling of 2013-070B.